The texture of this concealer feels fairly light (not quite Urban Decay naked light, but not too far off), yet it provides full coverage for my dark circles. And, it holds up throughout the day. It's is definitely going to be in my regular rotation. As a spot concealer, this concealer may be a holy-grail. It covers completely, blends seamlessly and stays put. On my under-eye area, I have not been able to get this to not crease in my lines, no matter how much I blend with my Beautyblender. Still, the coverage is beyond anything I've ever used. Love this concealer. Great for undereyes and blemishes. 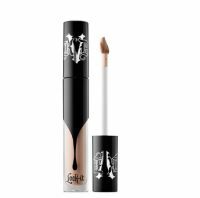 It's lightweight, yet provides serious long-lasting coverage. Wore it to cover a bad zit to a wedding and it lasted all night.